The philosophy & mission of being an Integral Yoga Teacher is to "Practice, live, and impart the Integral Yoga teachings of Sri Swami Satchidananda, enabling self & others to experience the Supreme Peace and Joy, and to share that Peace and Joy with one and all". 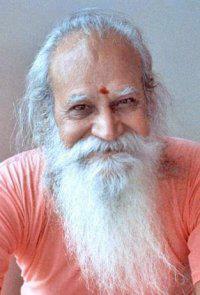 Integral Yoga was founded by Sri Swami Satchidananda, one of the world's best known & respected Yoga Masters. Sarvesham Mangalam Bhavatu Prosperity be unto all. Sri Swami Satchidananda or Guru Dev, as he is also fondly known to his students & disciples, has been a leading light in Yoga throughout his life time & beyond. His teachings continue to inspire us to lead "Peaceful, Easeful & Useful lives" ~ Integral Yoga is a living Yoga, integrating yogic philosophy into our daily lives to help us live in a more harmonious manner & treat each other with the same respect. An Integral Yoga Hatha class will include a beautiful blend of Asana (yoga postures), Mantra (Yogic Chanting), Pranayama (Yogic Breathing), Meditation & Yoga Nidra (deep relaxation). Local class details in Northamptonshire with Harshani can be found HERE for Thrapston, Gretton & Oundle Hatha Yoga Classes & workshops.